Steve Williams of Umatilla in the center, sets up to defend against Mark Lovrin of Columbia bring the ball into the Umatilla half court. 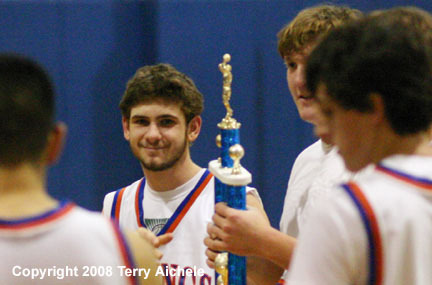 UMATILLA - The Umatilla Vikings defeated the Columbia Bruins in the championship game of the Columbia River Clash at Umatilla on Saturday December 13, 2008. 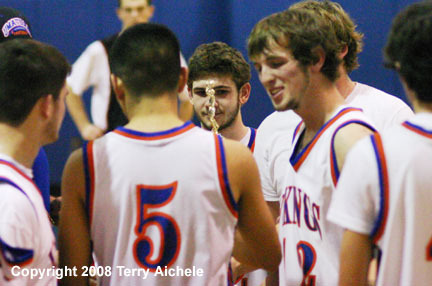 Umatilla won 71-51 with dominating offense and defense play. Umatilla controlled the ball from the beginning of the first period. Two minutes into the first Umatilla lead 9-2. Umatilla held the Bruins to seven points for over two minutes while scoring nine points to take a 20-7 lead. The Vikings ended the period with a 24-9 lead. Columbia outscored Umatilla 16 to 8 in the second period but Umatilla still lead at the end 32-25. 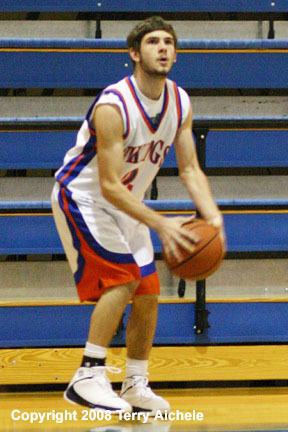 Taylor Pankey of Umatilla hit a couple of treys during the period. Umatilla outscored Columbia 25 to 10 during the third period. Columbia closed to 31-41 at 4:35. At that point Umatilla held the Bruins to just four points for the rest of the third period. The crowd went wild when Steve Williams hit a three pointer from near midcourt with 1 second to play in the half. Williams had a look of surprise that transforemed to satisfaction on hitting the trey as he walked to the nearby Umatilla bench. Williams shot gave the Vikings a 57-35 lead. Umatilla coasted to the win in the fourth scoring 14 to 16 for Columbia. Coach Tony Villanueva of Umatilla rotated his players freely as the game wound down. The Vikings had a good game in the final. Steve Williams, Peter Stice, Nathan Creason, Kasey Pankey, Ruben Navarette, and Zach Phillips were among the Vikings that had a good championship game. The team gathered a midcourt following the game to accept the trophy and admire the reward for their hard work. 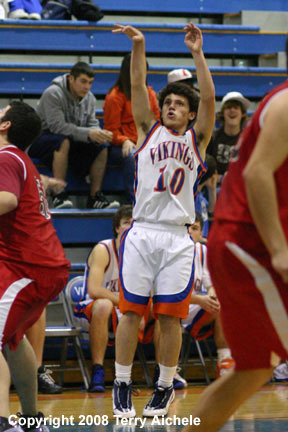 LEFT - Steve Williams of Umatilla eyes the basket as here prepares to take a shot. 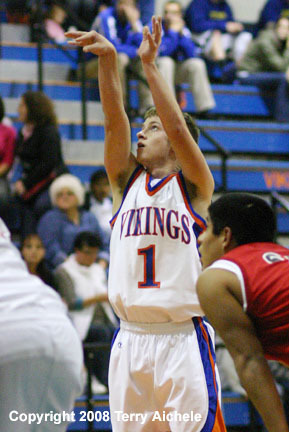 RIGHT - Viking Levi Russell shoots a jump shot. 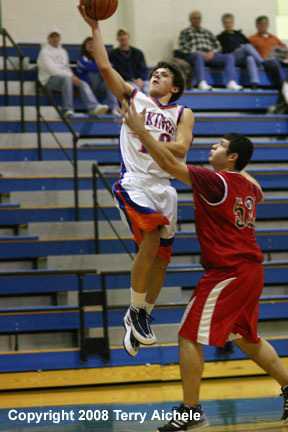 LEFT - Peter Stice of Umatilla leaps horizontally in an attempt to grab the basketball. 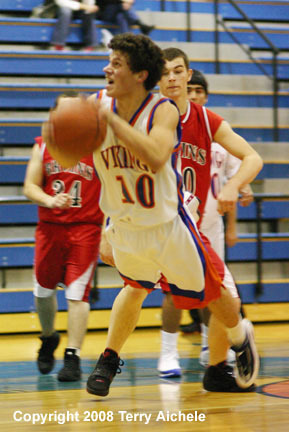 RIGHT - Viking Peter Stice drives in for a layup. 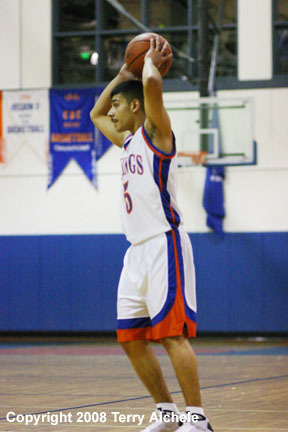 LEFT - Ruben Navarrete of Umatilla looks for someone to pass the ball to. RIGHT - A Bruin and a Viking battle for a rebound. 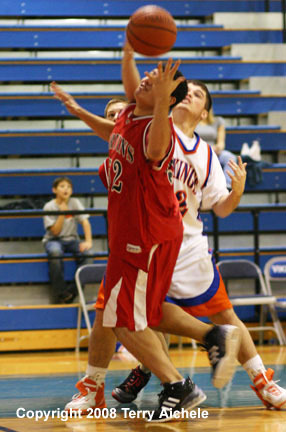 LEFT - Peter Stice of Umatilla shoots a jump shot. 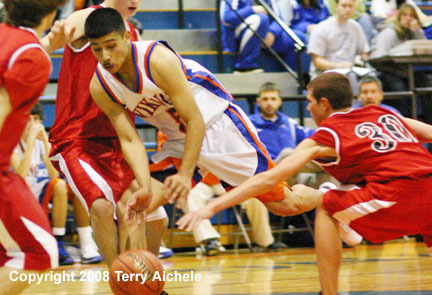 RIGHT - Ruben Navarrete of Umatilla and Mark Lovrin of Columbia dive for a loose ball.